As mentioned in the previous post I stopped bending the RV-12 fuel tank to fuel pump line before bending the 90 degree upward bend that would place the fuel line directly under the fuel tank. This shift from the plans is to accommodate a modification which adds a fuel drain under the fuel tank. One of the reasons the DOG Aviation RV-12 is being build as E-AB (experimental amateur built) as opposed to E-LSA (experimental light sport aircraft) is so modifications that make good sense can be made during the building process, while it is easier to do so, as opposed to after construction of the aircraft is completed. 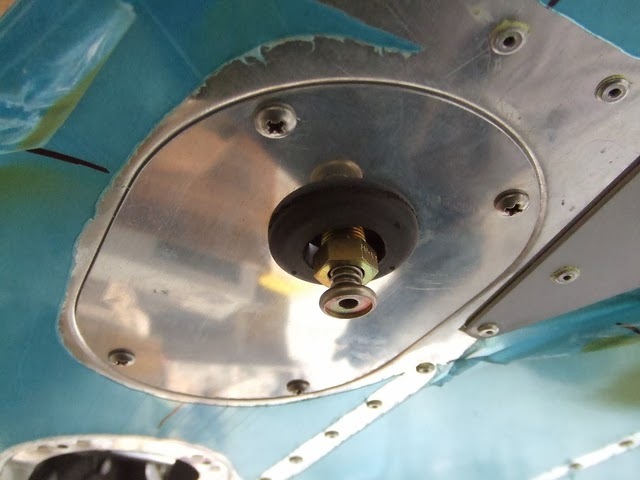 Jerry, a savvy builder from England, decided to make and install a fuel drain sump right below his RV-12's fuel tank. Much the same as others who have seen this slick modification, I too like the idea because fuel quality can be checked right at the tank as opposed to at the gascolator on the firewall. And as a side bonus, the modification will make it a piece of cake to drain the fuel tank without running the electric fuel pump. Below - a few photos of the modification as posted by Jerry on the RV-12 forum on VAF (Van’s Air Force). 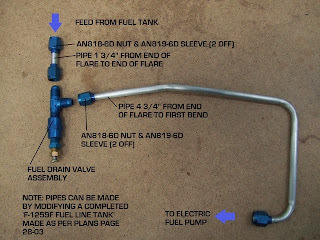 Fuel tank modification parts description and layout. 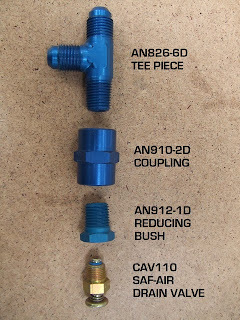 Fuel tank modification - close up of required parts. Fuel tank modification – fuel drain protruding below hole cut in inspection plate below fuel tank. The DOG Aviation procurement department has already obtained all the necessary hardware for the modification. However, work on this portion of the fuel line plumbing will need to wait until the fuel tank (part of the finishing kit) is assembled and set in place. In the mean while work will continue on the fuel line plumbing from the fuel pump forward. Moving on, the next fuel line to be constructed is the fuel line running from the fuel pump forward to the fuel on/off valve. After the tubing was cut and prepped the end was flared. Following the plans, two bends are made to form an offset between the fuel pump and the F-1204D bulkhead. Next the long fuel line is fished through the two grommets in the F-1204D and F-1204A center channel bulkheads. Frequent readers of the Blog may remember me following the advice from fellow builders to file down the tabs inside those grommets. This tip paid off is spades … even having filed down the tabs, the F-1204D bulkhead grommet still offered quite a bit of resistance to the fuel line but it still slid into the grommet after a little coaxing. Here is where I hit the second speed bump. I could not feed the fuel line through the F-1204A bulkhead. I was by myself and there is no access inside the center channel except for reaching in from the sides ... but if doing that, I couldn’t push on the fuel line and keep it aligned with the grommet at the same time. Pondering the situation a while, decided to try to use the trusty 1/4" pin punch once again. The fuel line was pulled back a little and the pin punch was inserted into the grommet and worked into the fuel line in the hopes that the pin punch would help align the fuel line to the grommet. Worked great! A 1/4" pin punch pushed through the grommet and slid into the fuel line. Once the 1/4" pin punch was inside the fuel line, the fuel line was pushed forward and the pin punch helped align the fuel line to the center of the grommet without enlisting outside help. Fuel line pushed forward through the grommet on the F-1204A bulkhead with the aid of the 1/4" center punch used to guide the fuel line to the center of the grommet. Unfortunately, don’t have the time at the moment to continue due to Holiday preparations.